The WTE Claims Team can often obtain the entire cost of your new sewage system from your insurers. Most people have no idea that their failed sewage treatment system could be covered under their Buildings Insurance Policy. Even if the septic tank or sewage treatment plant is a long way from the building, it is often still covered under your policy. If this is the case, and we can prove that the problems are due to part of the system being damaged in some way, then it is likely that an insurance claim is possible. Even for those householders who are aware that they may be covered, registering and negotiating an insurance claim with an insurer is not simple and it is so easy to answer a question and invalidate your claim with that answer. They often ask technical questions which the homeowner cannot answer, or gives the wrong answer to and this will also invalidate your claim. Contact WTE and we will handle your claim for you, free of charge. 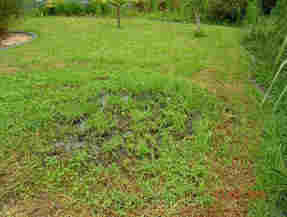 Typical failed soakaway drainfield from a septic tank. This has a high chance of being covered by the Insurance Policy. WTE arranges a survey of your sewage system, if applicable, and gathers extensive information about your problem. We detect any possible accidental damage that could support your claim. We write an 'insurance industry standard' detailed report on your behalf and register an official claim. We deal with your insurance company at all stages of the claim. If they contact you directly, refer them to WTE Ltd.
A WTE wastewater expert usually then meets with a representative from your Insurance company, on site, to discuss and verify your claim. The settlement is agreed and the works can commence, using one of our approved installers. If your claim is found to be valid, then the only cost to you is the excess on your policy - usually between £50 and £150 - and you only pay this if you WIN! Our involvement is free of charge. It often takes between 6 to 8 weeks, but WTE will speed up the approval by keeping in regular contact with your insurers. We will also deal with any Environment Agency issues due to the time-frame. You have nothing to lose. After a detailed telephone discussion about your sewage problem, we will decide if a site visit is required . We only take on cases that we feel are valid and which are covered under your policy.